Isolation Of Autistic and/Or Disabled Children: Who Will Be Elected To Live Alone On The Top Floor? If anyone doubts that Trump will commit war crimes, I assure you he will. Any parents who would isolate their disabled and/or Autistic child in an attic or solitary floor alone is creating a scapegoat. That will be Barron’s lifetime role. The torture it induces, neuropsychologists generally agree is similar to a captured soldier of war. Maybe this is why Trump thinks John McCain is “a loser” for being a prisoner of war. That’s a weakness, a strong message sent to Donald by his father Fred. Being Autistic but somewhat high functioning in some areas, my social-climbing parents built an “attic bedroom” aka “isolation chamber” for me to live when I was 6 until the age of 17. I was “at war” with my family, and didn’t have a clue. Though I was never tested for Autism, they knew something was very wrong, hence the geographically odd and isolated location of my bedroom, and opposite treatment of my siblings (and me). All I remember is “being in trouble”. All I can remember in conversations from my older sister was “You’re in trouble now”. “Why do you behave this way?”, etc. She was brainwashed, it appears, before I was even born. There was never once a conversation with her. My brother tried at times but I could tell was very uncomfortable around me all his life. At age 11, I saved both their lives from a burning housefire risking mine in the process in the smoke-filled burning building. That story was completely deleted from our family history. Fortunately, I still have several neighbors on facebook who are still alive and remember my entire oddity (including the fire) keenly. My cries usually went unheard or heard but ignored. The worst part was the isolation (this same isolation has been banned for grown trained military every Geneva Convention). Like Barron, I was far away from the core family unit. It was important that other family members did not see or hear what was being told to me. The attic “bedroom” was no architectural mistake or my imagination. Three years later my parents sold the house to build a larger one just a block away. It also had a larger attic bedroom (with more distance from my two siblings and parents who were altogether in the other end of the home. Guess who was assigned the “attic chamber”? Yours truly, in a second home. This was clearly premeditated. I told a favorite aunt, still living, about it. and she said, “We did make mistakes back then and didn’t know much about Autism.” She’s old so I didn’t argue, but hung up thinking, “A mistake is when one stumps their toe. A premeditated horrible crime that usually goes unnoticed is when you spend (back then $10k was a lot of money for a distant attic bedroom). At sixty-two, it still gets back to me when my siblings bully me from afar with gossip and lies (that is bullying an autistic). That is not “a mistake”. That is not having a backbone in adulthood to put a stop to it so it doesn’t pass to another generation. Too late with my family. It already has. But they will remember me as “the hated one” but the whistleblower of a large somewhat prominent family, who has been a “Golden Child Mill” for many generations. For the NPD, that takes a lot of scapegoating too. At age 6, when I cried for “an answer” as to why I couldn’t live normally with the rest of the family, the “excuse” was “I was a very smart/loved/creative child and “needed that kind of space”. My father even covered my walls with great college football pennants to enforce the “benign innocence” of his nefarious plan. Truth is, my parents encouraged and finally demanded my own siblings to bully me as did they. It was more of a warning. If they didn’t, they could be next. Often scapegoated children are “released from the hate” by their siblings and community after the parents are deceased and the child becomes an adult due to most knowing they were actually playing into “the family politics”. I was not given that luxury. I hope Barron Trump is. 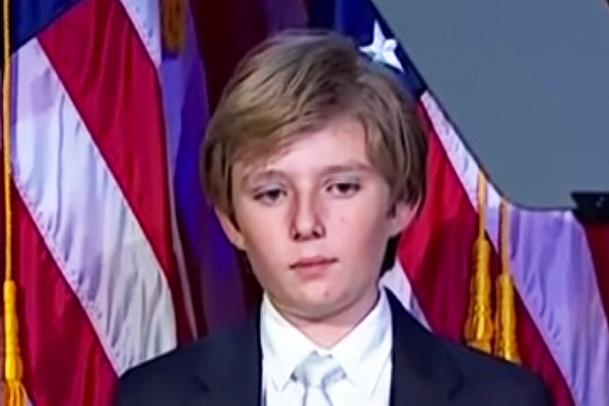 Today I learned that Barron Trump is possibly Autistic; and if not, has a similar condition. Having abstained from watching media lately, I didn’t know the story had been running worldwide. Not that the media is the final arbiter of health and cognitive disorders, but I took it upon myself to find videos and study them carefully. I’ve attached several. 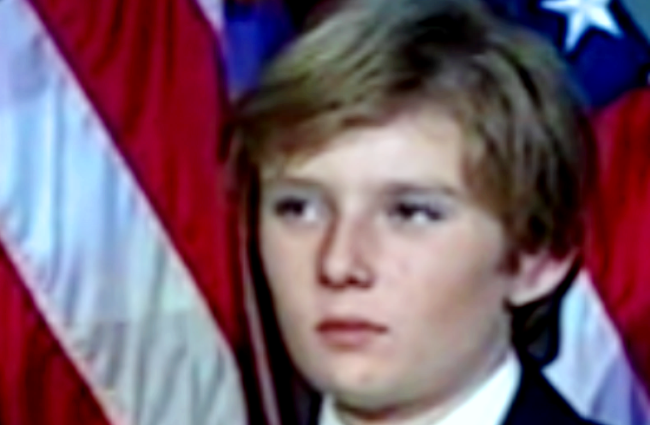 This was no surprise to me as I could see many common traits in friends and myself that Barron seemed to be experiencing. I was an embarrassment to my birth family and inconvenience as I imagine is Barron may be to his. I was gaslighted by my parents in the “isolation chamber” as they were creating a “human garbage can” aka “Identified Patient” (a black sheep was born); Black Sheep (or scapegoats) don’t just happen contrary to popular belief, they are created by NPD (Narcissistic Personality Disordered) parents. Autistics and/or other disabled or unhappy (or odd) children are usually chosen to be the “black sheep” bad kid. Given, I am not a neuroscientist or neuropsychologist and I cannot make an accurate prediction of Barron’s condition. But I can assure you, if you watch the video, you’ll clearly see he has many of the most common characteristics of an Autistic child. It may be something else, but it definitely hurts him badly, and rather than address it, his parents have decided to hide him away and claim vaccinations cause Autism (which has been debunked over and over by the medical profession). In any case, due to his “oddness” as Trump would find it, he’s been chosen to be scapegoated. That is a tragedy. What is clear is that Barron has a flaw that motivated his parents to hide him in their attic which is quite lovely, the top floor of Trump Towers, but some of the most effective “prison camps” are “quite lovely”. It makes them seem so innocent. 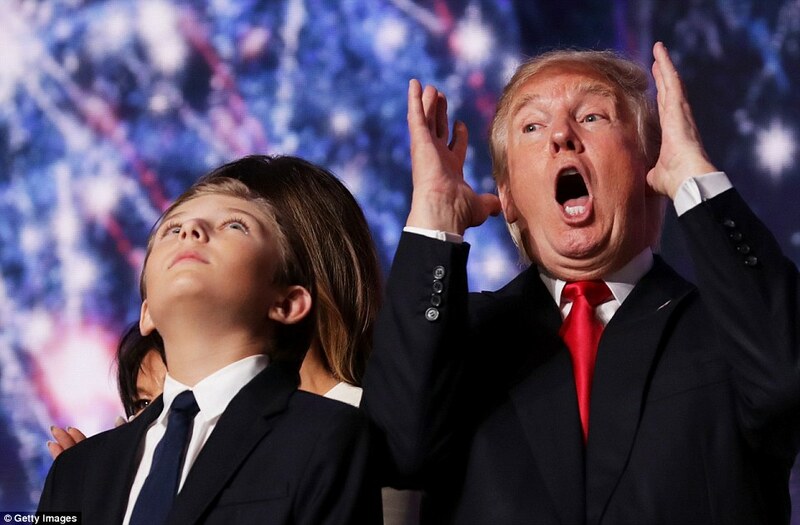 My prediction is they will have one or two more children but they will be “golden children”, and Barron will often be compared to them and everything that goes wrong in the Trump’s life will be Barron’s fault. A lot of press is now coming out about Barron’s plight. The very fact that he would live in the White House and leave his son is beyond cruel. It is true torture. He is a “prisoner of war” at Trump Tower. I don’t like the word “Symptoms” as Autism is not a disease but a condition, but here is a video that shows it, and GOPs shouting at him for “misbehaving”. Running for office is probably the cruelest thing one could do to their son, moving him alone to a large floor is beyond cruel. Trump is also a “vaxxer” believing the already debunked crap that vaccines cause Autism. Michaelangelo, Isaac Newton, Beethoven, Jefferson, Mark Twain, and many others had it (before vaccines were invented). It makes Trump’s non-apology to the disabled reporter even that much more repulsive. He is truly a sociopath. A “father” who does not defend his disabled child from abuse is not worthy of description. A mother/apologist who agrees with “Dad” is not any better. I post this not as a “feel sorry for me” as I’ve told my story before. I don’t feel smarter than anyone else for “recognizing it”. My wife also recognized it before I did (in Barron’s case too…I only suspected it). This is a “get ready for a rough ride”. When NPD parents will do this to their children, what in the hell will they do to those not related to them. 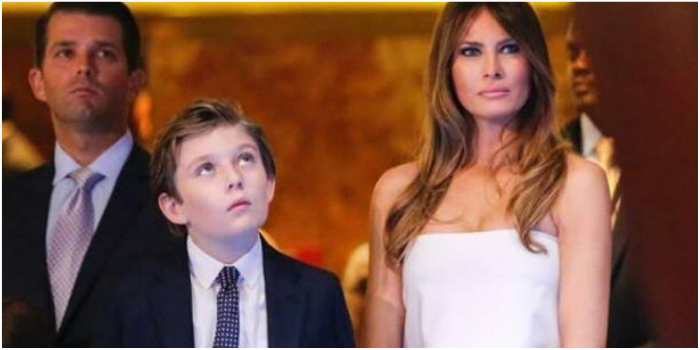 Whether Barron is struggling with Autism or some other condition, clearly Melania Trump is right. This should be a wake-up call to #stopthebullying. My sad prediction is that when Barron is old enough to understand some of this, he will no longer be what is known as “narcissistic supply” to his parents and they will most likely divorce. Most do when they base their entire marriage on the hatred of one of their children. You’ll never see this hate. In public, he will look like the most loved, pampered child on the history of this planet. Please use your brain. If this child lived in “rougher territory” and belonged to other parents, he’d already be taken away and in “children services”. It is time to give disabled and/or children (and adults) with cognitive conditions the same first class citizenry we give others. Otherwise, none of us are free, and the scapegoating continues for more generations until someone with a backbone stands up to the bullies. I am standing up to the bullies. Are you too; rather than “following the money”? It’s never too late and you’ll have little if any regrets during and at the end of your life; you’ll have nothing but regrets if you don’t (stand up to them). 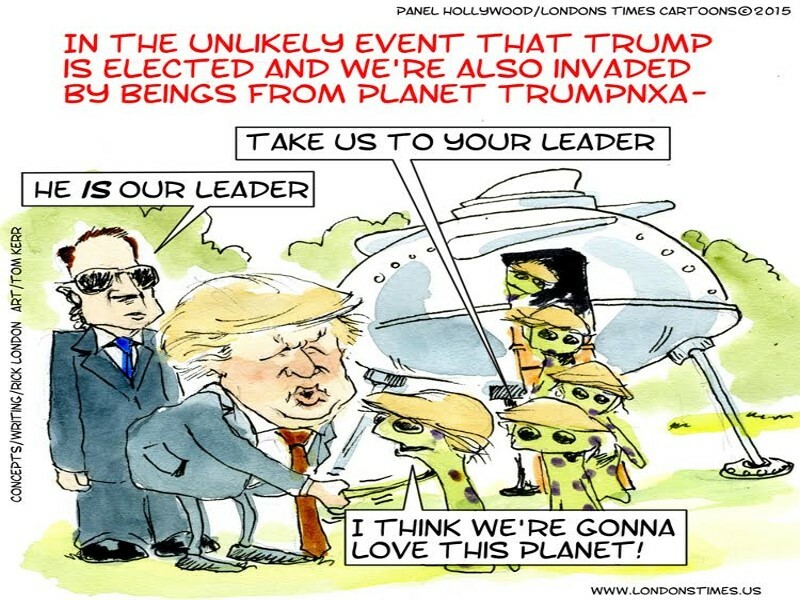 Rick London is a writer, cartoonist and designer. He is best-known for his Google #1 ranked Londons Times Offbeat Cartoons & Funny Gifts launched in 1997. No, no, not personally or even philosophically or politically, but he has to be one of the most generous of all politicians for humor writers, cartoonists, late night talk show hosts etc. And it’s not that he’s particularly any different than any other presidential candidate, because frankly he’s not. It would be unfair for me to single him out as “something special” in politics. Am an Independent and have voted both GOP and Democrat. My party days have been over for a long time. It’s not just the nutty things he often says……it’s…..the hair. Face it, I’ve seen better-groomed shucked ears of corn. The only real difference is, he has something that also belongs to many of us who have worked awhile on the humor side of arts and letters. That is, no filter from brain to mouth. He truly doesn’t say anything that all the other candidates don’t think (but have that invaluable filter so as not to say it)…. Aspies (Asperger’s Syndrome) like me often have that same (filter-free zone in the brain). So how could we Aspies not love him (at least in that respect). And of course being on the writing side of the cartoon biz, we almost feel guilty. Who else so generously would write the material for free, and not pay us? Donald, you are EVERY cartoonist/humorists Apprentice in our hearts. And trust me, we’d never ever fire you. We’ve been creating some “The Donald” cartoon gifts, cards and tees for the past 4 or so years.